The Stunning Beauty is a hand delivered gift. These gifts are delivered by one of our local design centers located throughout the United States and Canada. Same day delivery is available for most gifts when ordered before the cutoff time. The cutoff time for The Stunning Beauty is 2 PM in the recipient's time zone. I sent these flowers to my colleague as an appreciation for all you do gift, and she absolutely loved them! Wonderful service, arrived within 3 hours of placing order. Bouquet was so beautiful as pictured. My wife totally loved these flowers. My guest took various selfies and copies the vendors info for themselves. A total hit. Fantastic job once again! My girlfriend loved it and exceeded my expectations. I'll continue to be a customer until I find a reason not to. Thanks! Great customer service. Delivered on time. My friend texted me right away thanking me. She said the flowers brightened her day. I could not be happier. Thank you ever so much...perfect sercvice...very appreciated.. This wonderful bouquet was sent as a surprise to reward a great achievement. My daughter was thrilled. She sent me a picture of her flowers that were perfect. I thank you from 1500 miles away! Great bunch and timely delivered! Was nervous ordering from an international location for a local delivery - but everything was great! I ordered this arrangement online out of state as a surprise for my wife who was visiting her ailing grandfather and mother who lives with him to help take care of him. VERY IMPRESSIVE! My wife and I are very satisfied with the service and arrangement and recommend this site whole heartedly! GOOD JOB! I was toled that they were beautiful. Thank you so much for the wonderful flowers. It meant a lot since I was unable to go to the service. Thanking you again. Best Flowers says my Mom! I usually call a local florist and pay about what I paid for these flowers, I can't believe she said they were the best ones ever. Looks like the local place I called wasn't all that good for all those years! It also came with chocolate! I called on the day it was delivered! Great stuff! Flower Arrangement Was Absolutely Beautiful! This arrangement was ordered for a 40th birthday party celebration for a friend living in San Diego. I'm in Chicago. I ordered online through the company website. 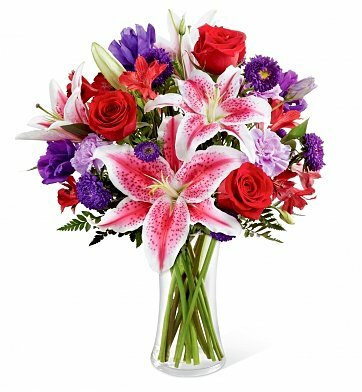 Received order confirmation, great customer service and even a verification from the guest of honor that the flowers arrived. This table setting really made the party and dressed up the occasion. Good quality flowers and they're still fragrant!!! I will definitely order from you again when the need to do so calls me again. Looked absolutely beautiful. Smelt great and brightened up my fiance's day. Thank you so much for delivering them well on time. My wife absolutely loved them. Thank you very much!!! ordered flowers late at night Feb 13 for valentines day and they arrived at my sweethearts place of work just in time. would recommend for such last minute situations. she loved the flowers, btw, and her employer even shed a tear he was so touched.